Champions League: How can Arsenal beat Barcelona? Arsenal host Barcelona in the Champions League on Tuesday, hoping for a repeat of the last time the two sides met at Emirates Stadium in February 2011, when the Gunners were 2-1 winners. But the Spanish champions have not lost since 3 October last year - a 2-1 defeat at Seville - and that is one of only three losses this season. 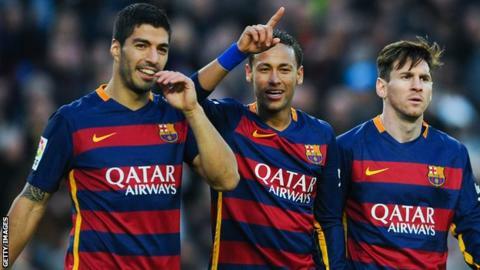 Still, a side boasting the talents of Lionel Messi, Neymar and Luis Suarez can be beaten. All you need is a solid game plan, great performances from every player, huge slices of luck and hope they have an off day. But is there anything else that can help a side to defeat mighty Barcelona? We've had a look at their recent (rare) defeats to see if there are any common themes. Athletic Bilbao beat Barcelona in the Spanish Super Cup in August and, over two legs, had 10 bookings and a sending off. Seville had five players booked in their La Liga win. This season, Barcelona's opponents average just over three bookings per game but the teams to have beaten them average more than four. Maybe the Catalans just don't like it up 'em? Espanyol were the last team to take league points off Barcelona with a draw on 2 January. They did it with five bookings. Emboldened, they followed that up with six bookings and two red cards in a cup match four days later. But they clearly got the balance wrong and ended up losing 4-1. Atletico Madrid are the only team to have beaten Barcelona in the past three years without using all three substitutes - they used two in a Champions League quarter-final in 2014. Every other winning team used all their subs - and of the 50 substitutions made by winning teams, exactly half have been made in the last 10 minutes. Of those, 21 were made in the last five minutes. So be ready to wind down the clock as Barcelona pile on the pressure late on. Barcelona's 4-1 humbling at the hands of Celta Vigo earlier this season came just three days after a 4-1 win against Levante. Last season's 0-1 home defeat to Malaga followed a 5-0 win over Levante, while a 5-1 win over them the previous year was followed up with a home defeat to Valencia. Barca tend to win big ahead of a loss - eight of their 17 defeats since 2013 have followed a game in which they've scored four or more goals. Be Bilbao. Or Sociedad. Or Celta Vigo. In La Liga, just four teams have inflicted more than half of Barcelona's defeats in the past three years. Real Madrid are the obvious ones, with their fierce rivalry and serious financial backing. Although they've only got a 0-4 home defeat to show for it so far this season. But while not exactly having Barcelona on the run, Athletic Bilbao, Real Sociedad and Celta Vigo have each enjoyed a couple of wins over their illustrious opponents in the past few seasons too. Louis van Gaal: How long can the Man Utd manager cling on? Manucho made just three substitute appearances for Manchester United before joining Vallodolid. You'd expect Real Madrid to topple their rivals now and again with the likes of Gareth Bale and Cristiano Ronaldo to call on. But the Celta Vigos, Malagas, Granadas and Vallodolids of this world have done it without the big bucks and the big names. It's true they have called upon some former Premier League players to lead them to victory - but not necessarily players who set the English game alight. Step forward Celta Vigo strikers Iago Aspas (Liverpool) and John Guidetti (Manchester City), Malaga's Liverpool loanee Tiago Ilori and Sociedad pair Carlos Vela (Arsenal) and Esteban Granero (QPR). Last season's triumphant Vallodolid side also had Manucho - you know, the ex-Manchester United and Hull player - in their ranks. The only teams to have beaten Barcelona in the Champions League in the past two years are Paris St-Germain and Bayern Munich - two sides boasting genuine world stars such as Robert Lewandowski and Edinson Cavani among their expensively assembled line-ups. And they still couldn't stop Barcelona reaching, and winning, the final. But with Petr Cech, Mesut Ozil and Alexis Sanchez giving the Gunners an X-factor, they will always have a chance. Petr Cech has faced Lionel Messi eight times and has never conceded a goal from the Argentina forward. Do they have the aggression to 'go hard'? This one's open to debate. They will have options on the bench no doubt - and boss Arsene Wenger likes to use all three subs (he has done that in eight of their last 10 games). Check. They certainly have stars and obviously boast Premier League talents, despite letting Carlos Vela go. Check. But they aren't Real Sociedad or Celta Vigo. And sadly for Arsenal, Luis Enrique's side didn't play Levante at the weekend either. They beat Las Palmas 2-1. So, tactics aside, the signs aren't good. And even if they beat Barcelona on Tuesday, they'll have to bear in mind, ahead of the return leg, what happened to the other three sides to beat them this season: Athletic Bilbao and Celta Vigo both had six put past them by Messi and Co the next time the teams met. Seville got off relatively lightly with a 4-0 loss. How long can Van Gaal cling on? Read more on Louis van Gaal: How long can the Man Utd manager cling on?